Pure Vida founder Shawn Kingsbury helps recovering addicts discover meaningful activities. Talking over the sporadic, jackhammer-like charge of an air compressor, Shawn Kingsbury is giving a tour of Pura Vida Recovery, the "active, sober community" he founded as a nonprofit last year. It's housed in a brick building on North Monroe, just six blocks from where he grew up. Here is the meeting space. Back here are the offices. Over here is where the lockers will be. This — a spot with workout equipment and a huge industrial tire propped against a wall — is the exercise room. Some of the infrastructure already exists in nascent form. Some of it is under construction at this very moment. The work-in-progress atmosphere of Pura Vida speaks to its rapid implementation based on an idea that Kingsbury, 38, hatched in a halfway house in Maine less than two years ago. It also highlights the evolving nature of the program itself, founded on three pillars — "volunteerism, education and physical activity" — that Kingsbury felt were essential to his long-term recovery from alcoholism. What brought Kingsbury to this point isn't vastly different from other stories of addiction. He started drinking heavily in high school. He drank himself out of college. He excelled in Army basic training until weekend benders became an option. He moved to New York, then Seattle, L.A. and Maine in the hopes of outrunning old friends, old habits, old scenes. "Ultimately," he says, "alcohol destroyed everything I ever cared about." Although he amassed clean time on the back of detox clinics, faith-based recovery and 12-step programs like Alcoholics Anonymous, it rarely amounted to anything substantial. After several relapses, he wound up at Serenity House in Portland, Maine, where, to counter the mounting "negative vibe" inside the house, he piled his six roommates into his truck and took them on a hike. "On that winter day," he says, "there was this camaraderie and convening with nature that really solidified my desire to stay sober and my connection with these guys. That's when I started to ask, How do I help other people do new things in their life? "That transitioned to the YWCA a few blocks from our house. The young guys wanted muscle, and I knew how to work out, so I started taking them to the gym with me. And right there, on this small strength floor, all these guys from other sober houses would come into this gym, and there was open, free conversation about our recovery: What are your struggles today? What are your victories?" In December 2013, Kingsbury packed up his canine sidekicks Azul and Amor and drove back to Spokane with the intent of starting Pura Vida. "I got a job here working construction, and I had no clue how to start any of this. I reached out to people in recovery circles and started a Saturday morning hike. Then I started taking people to the gym with me, just like I did over in Maine. The more I reached out, the more people fell in love with the idea and got behind it." Jodi Menne is one of them. She first encountered Pura Vida in a newspaper write-up. "I hadn't even finished reading the article before I e-mailed Shawn and asked, 'Can I be of help?'" Seven years ago, Menne, now 45, resolved to quit drinking, but she had trouble finding a solution in 12-step programs. "I didn't feel like the people at AA understood me," she says. "In their defense, I wasn't trying, either." "The thing that saved me back then was that I was an athlete. Running was my recovery. I went from drinking 30 beers a day to running 20 miles. If there was a program that I could have gone to and been active, it would have been a life-saver." 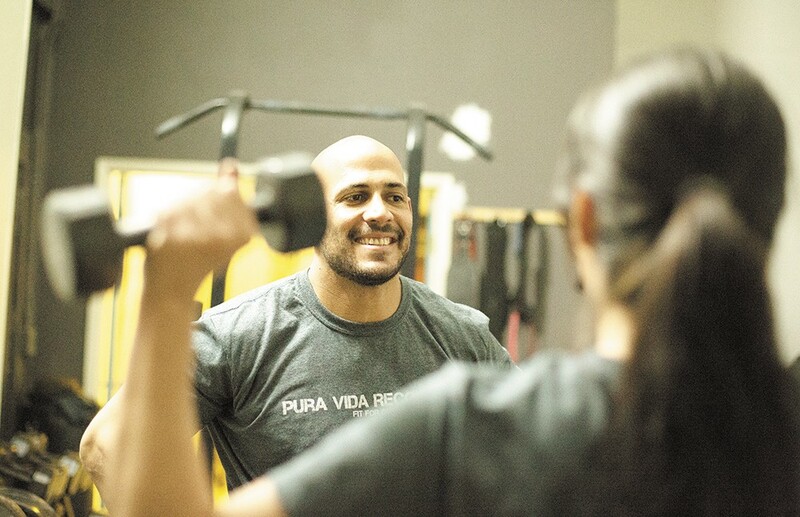 After connecting with Kingsbury earlier this year, Menne, a professional personal trainer, established the Women of Pura Vida support group along with several yoga classes. At the start of each session, the participants check in with one another on their emotional states. Then the workout begins. "That's the huge difference," she says. "We're active, we're moving. We're not just sitting and then going outside to smoke cigarettes and drink coffee." Whereas Menne's yoga classes hit upon two aspects of the mind-body-spirit trinity, Chris Jensen's mindful writing workshop at Pura Vida addresses another pair. "This approaches writing as a form of meditation," he says. "One of the core exercises is that we meditate for five minutes, then we free-write for 10 minutes. It's about letting the thoughts flow. It's especially helpful for people who are really new to meditation, and who find that practice abstract and difficult." Jensen, 38, is a recovering meth addict. His story echoes that of Kingsbury, whom he met in a 12-step meeting between short, white-knuckle stints of clean time and difficulty escaping a familiar scene. "I felt like I was trying to eat my vegetables in a candy store. I couldn't latch on to a recovery program that was working for me." He says that Pura Vida's writing workshop helps him develop meaningful sober relationships and remain "accountable" — just as it does for those who oversee and participate in its film and photography workshops, dead-lifting training, hikes, paddleboarding excursions and musical jam sessions. "In a lot of traditional approaches to recovery, early in sobriety they want you to perform service, but it's very limited service," Jensen says. "They ask you to make coffee or greet people at the door. They're functions that help engage someone in the community, but they're not vital. I feel like I've found my people and my purpose here." As the Pura Vida program calendar and community grows, Kingsbury is busy searching for additional donors to help sustain the quality and reach of its services. Right now there are around four scheduled activities per day — including Spokane's first Crystal Meth Anonymous group — available free of charge. The only requirement is at least 48 hours of sobriety.